So……..hoping not to disappoint, lets back track a bit to those magical few days when we went to get Foxglove back………. Arrived at the marina really early to catch all the action. Foxglove was still undercover ready to be revealed…….She did not disappoint. The work that Sally Tooze has done was absolutely stunning!! Everywhere I looked there was just new things to see. All I think I was saying was Wow, oh my goodness it is so nice, Wow, amazing……you get the idea. Sally was still busy putting things back on Foxglove and Rob Shone (the joiner) was there putting some final touches on for us also. Everyone was still working hard to make sure everything was on, fitted, shining, and ready to go! We had to wait for the tractor to come and pull Foxglove out so we took the opportunity to go get a bite to eat and drink in the cafe there while we waited. 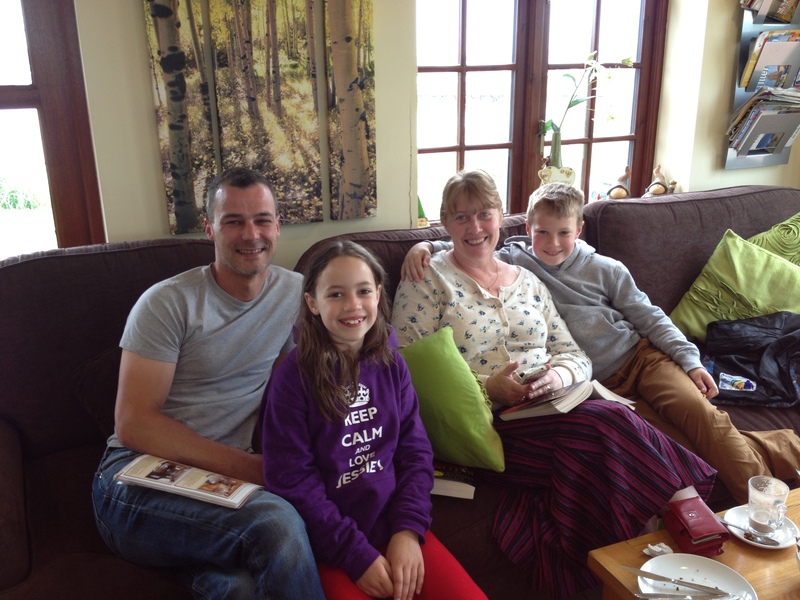 Met a lovely family there who I promised to say hello to………Hi Edward, Wendy, Thomas & Lucy off Narrowboat Katharine. We told them all about the blog so I hope you have got the chance to finally see your picture on here. Hope to meet you again one day on the canals. We then saw the tractor arrive around 1 pm…….OMG as they say…….this was finally the moment we had been waiting for. All those months after buying Foxglove and then the last 4 weeks of having her painted, all came down to this moment. It was everything and more than I expected. Foxglove looks amazing. Huge thanks to Sally for everything she has done. We statyed at Overwater marina on the Tuesday night as it was torrential rain for the rest of the day so we took the opportunity to get settled and put all the food shopping away, have a quick clean up and plenty of rest for the next few days ahead as we needed to get to Mercia Marina by Sunday. What a way to start your journey in a newly painted boat than to go through the Audlem flight (15 locks) and then carry on through another 10 locks for the rest of the day. Roy was the first to drive her out of the marina…….careful not to bump her, everyone was watching which puts you under even more pressure. 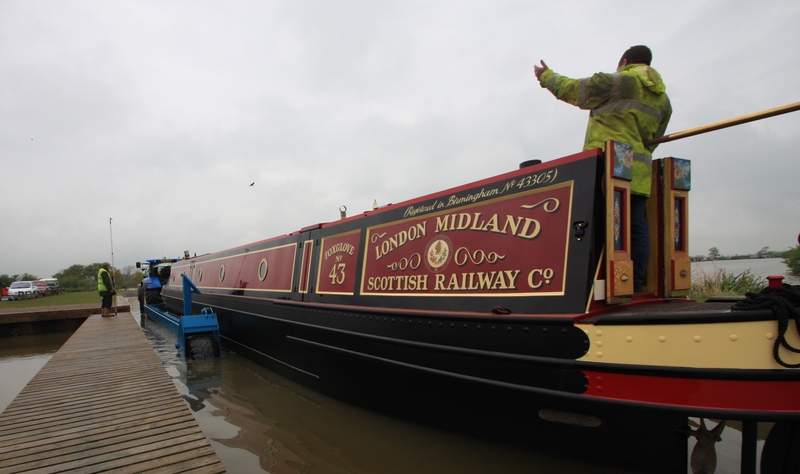 We waved goodbye to everyone at the marina and off we set………..only 25 locks to do and it was my turn to drive ( cruise, whatever the terminology you like to use). I must have had a look of horror on my face coming up to the first lock…….stress…….oh my goodness…….that was an understatement………..people were saying what a lovely looking boat and trying to talk to me……..I was thinking in my head………..please just let me concentrate and let me get this through the lock in 1 piece and all paint still in tack ( that was the polite version of what I was thinking). Anyway, all was good……First lock done, another 24 to go. After lock 3 I had calmed down a little bit……I think my face might have looked a little more relaxed. To cut a 9 hour story short we moored up at Knighton late on in the evening, all 25 locks done and with relief that the boat was o.k (teeny weeny little scrape on the blacking, that was all……I was surprised Roy didn’t get his paint brush out that evening!) It had rained in the afternoon on that day and I have to say Foxglove looked stunning with the water droplets settled on her. She really does look fabulous. Oh my goodness did I ache on that day. I think it was from being so tense going through all those locks. We were up though bright and early and left our mooring by 8am as we knew we had a long day ahead of us. We were on a mission to get by Mercia by Sunday. The sun came out and so did other narrowboaters. The canals were starting to get busy but it was a lovely day and so we made the most of it and travelled until 7.30pm that night. 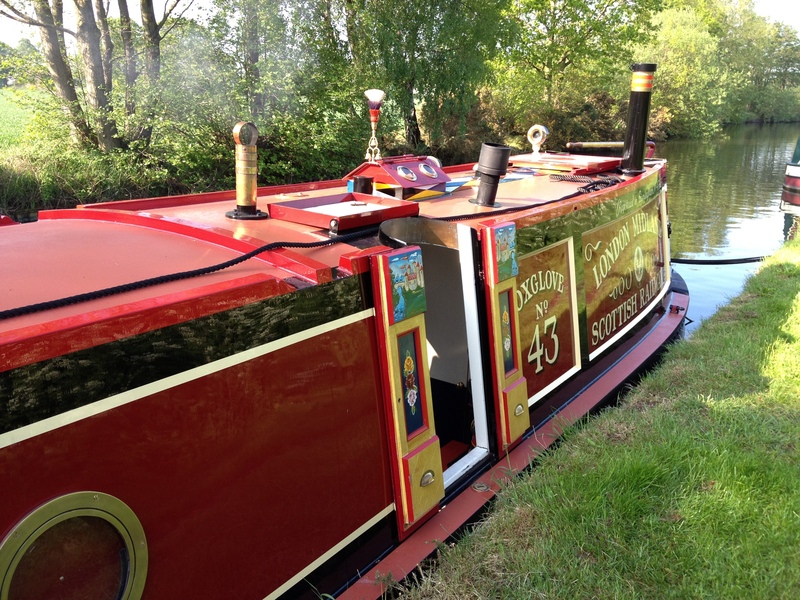 We went through Norbury, Gnosall (saw our very first boat again, Clare-Louise) and then moored up at Gailey. I think we were in bed by 9pm as we were exhausted. Each night we looked at the map to see if we were still going to make it or not…….so far so good! 1. Wish missed the boat as she went to jump on and ended up in the canal. She is fine though, Roy went and bathed her immediately…….this is when the next disaster happened. 2. Sun burnt. I have never got so sunburnt so quickly in all my life. Whilst Roy was bathing Wish I was driving the boat and my tiller arm, as I like to call it, got abosultely burnt within an hour and a half. It was so hot that night you could feel it burning through my nightie. I looked like a lobster. 3. Muck for luck- well not quite. Roy stood in dog poop!! Absolutely disgusting. Banned from stepping on the boat with them on he left his shoes on the back of the boat overnight only to knock them in the cut the following day! 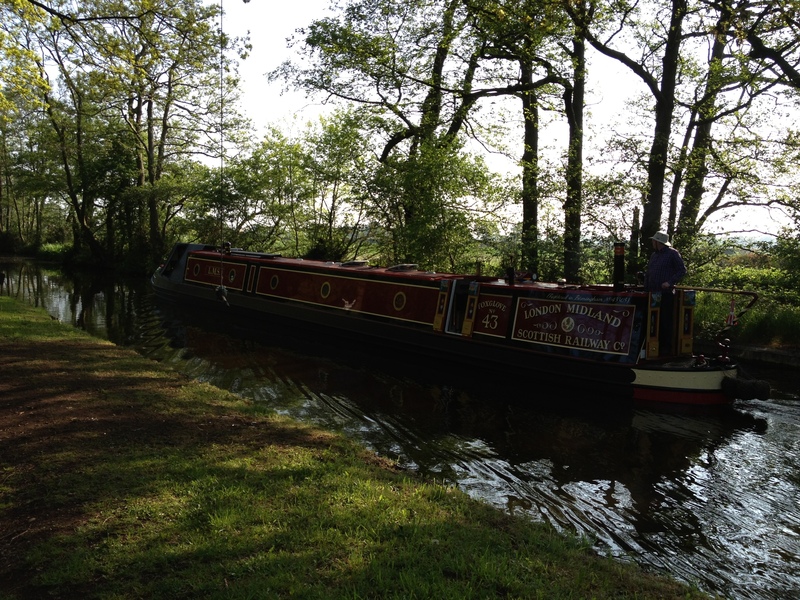 The day did ended though really well with us moored up at Rugeley, at the aqueduct over the River Trent. Friends Janet & Angus came and surprised us with a bottle of wine and some beers. They stayed until 10.30 that night…….really goodnight…….lots of laughs as always. Love you two!! Saturday 1st June – The day I had dreaded. 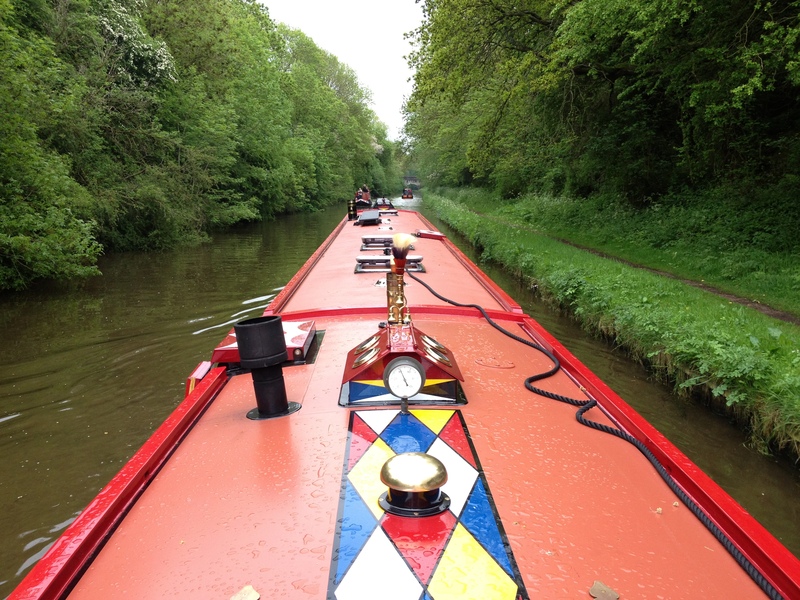 Woke up exhausted today and all I wanted to do was to sleep and knowing where we had to go today didn’t put me in the best of moods……..we were heading for Fradley Junction, on a Saturday, Bank Holiday week, half term……..Oh my goodness I could see this being a nightmare. I was trying to put it off but knew that I couldn’t…….I just had this vision of it being so busy at the junction stuck in between the locks, being thrown everywhere, scratching the boat……etc etc……do you get what I mean? There were 5 locks at Fradley to get through…… just as I had thought it was so busy……we were boat number 5 to go through the first lock. 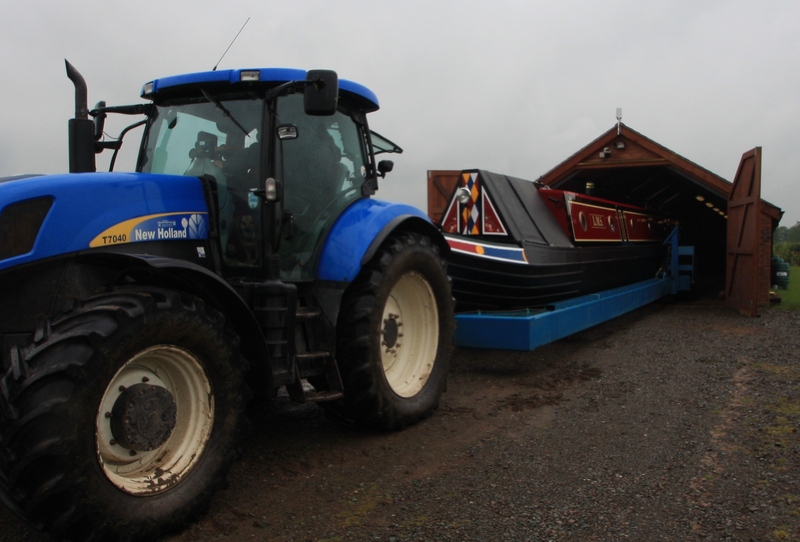 This was the first time we had to cue at a lock over the last few days……….Didn’t they knew we were on a mission and we had to get to Mercia the following day………I thought we would be forever at Fradley but luck was on our side today. Went though the first lock and then everyone in front of us decided to moor up and we went through the next 4 locks like a breeze. 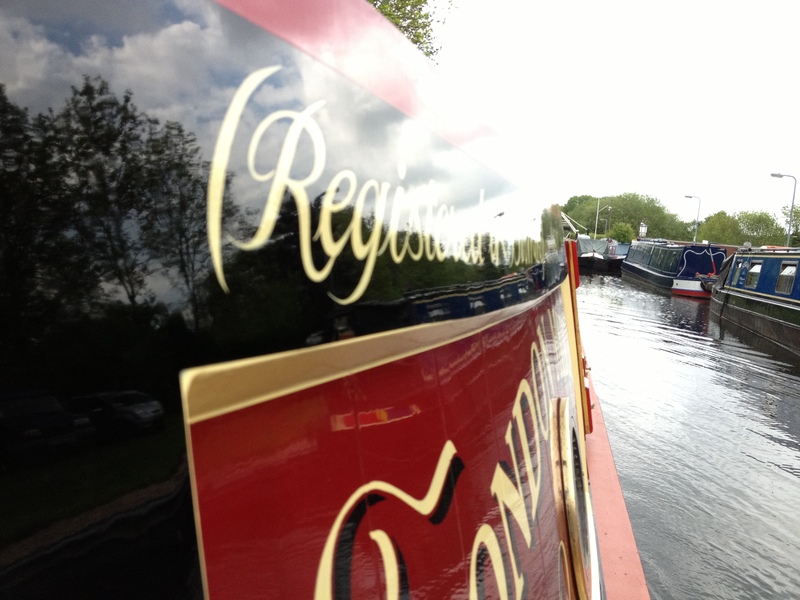 Every lock we went to was being manned by CRT and a boat was coming out at each one so I managed to time it just nicely to go straight in. What a relief! 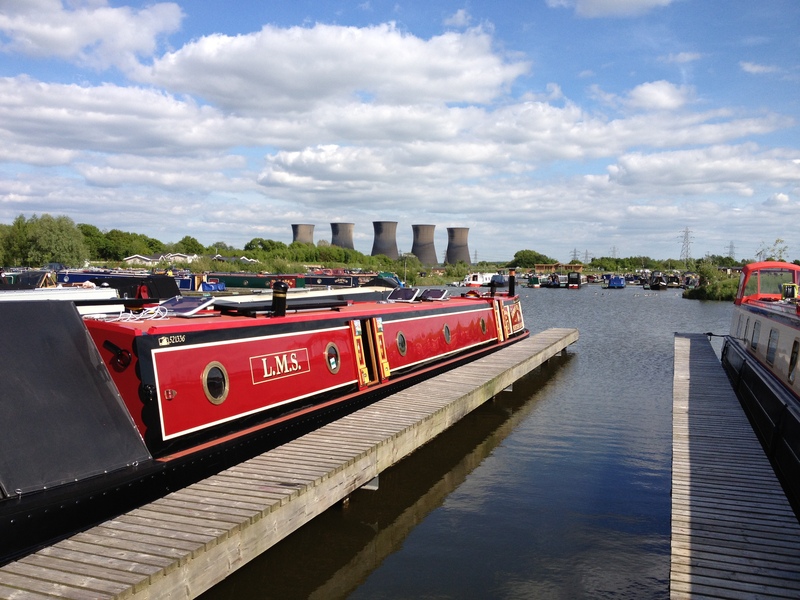 It was a good job as well because I had never seen Fradley Junction so busy with people. Foxglove was photographed so much on this day I found it unbeleiveable. She was the talk of the towpath on that day. Sally if you are reading, you must feel so proud of yourself as everyone could not believe it had been done by hand and they thought it was fantastic. I am sure Sally will be getting lots of phone calls as quite a lot of people took her details. Even one of the CRT volunteers had his camera on him and he actually stood at the back of Foxglove to have his photo taken on her. He said we had made his week. Him saying that had made my day! The CRT people on that day were very helpful and made my day very easy. Thank you to you all. We moored up that night just after Branston Lock. 1 more lock to do tomorrow and only a few hours to go. I was getting excited. Sunday 2nd June- Final day of travelling. Managed to get a bit of a lie in this morning which was well needed. We knew we could take it easier today as we only had about 3 hours to do and 1 lock. Hooray!! The sun was still out which was great. After the last lock was done I went inside the boat to have a bit of tidy around as we had none stopped travelled since Wednesday. Not long after I had been inside I heard Roy give a little wah wah on the klaxon……well it wasn’t quite a wah wah noise but that’s the closest word I could think of, I think you get the general idea. Anyway, I popped my head out through the side hatch and could not believe what I saw……..
No-one would have believed me unless I had taken this video……. Anyway, the little pigeon stayed with us for at least half an hour before I lifted him off to fly away. It was a homing pigeon as it had rings around both feet. That was why it was tame and friendly………and it never pooped all over Roy! At 1.30pm we could see the marina……….hooray……we had finally made it. Off we went around the marina to find our new home. Greeted by our new neighbours Ann & Terry who are lovely , we were made very welcome. It was such a relief to finally arrive. Guess what was the first thing we did? 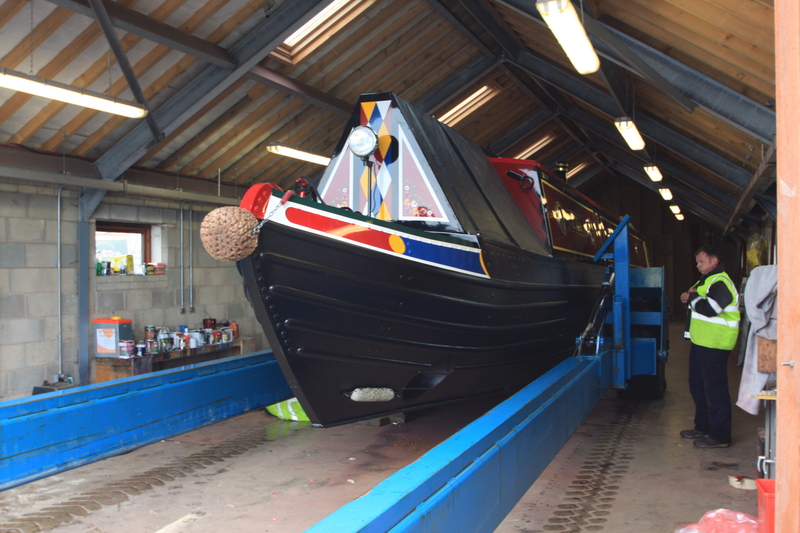 Only those who know me really well would know what I did……..
We washed the boat off ! I had really looked forward to this moment. I know some of you may think this a little sad but I actually don’t. It was lovely to wash her off knowing that it made a differencee. Before she was painted it wasn’t even worth washing because it didn’t look any better but now………WOW………the shine……..the smoothness………Its like an advert for shampoo!! I was in my element. Washed off all bird poop off the roof and all the dust and dirt it had collected over the last few days. 81 miles 55 locks, all washed off and she looks absolutely amazing!! The next thing we did was well deserved……..coffee and cake in the Willow Tea Room at Mercia Marina followed by an afternoon nap in the boatman’s cabin! Perfect end to a perfect few days! Well that’s it folks………that was our few days we had to get Foxglove back to her new home. We seemed to have lost a passenger though along the way……..
Do you know who I am talking about? 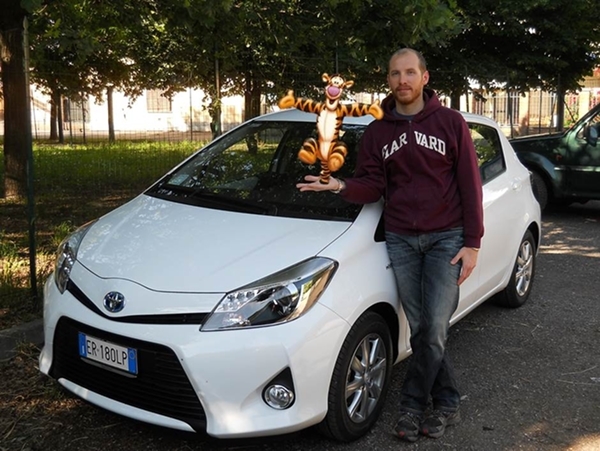 Anyway later on that week at work I was sent a picture from my friend, Davide, in Italy who has just had a new car. He said he had a unexpected visitor!! Looking forward to many happy days on Foxglove. Thank you all for all your support and comments over the last few months. Hi Clare, first of all congratulation…Foxglove is really stunning!!!!!!!! Reading through your long blog, and watching the Indiana Roy Jones’ video, it seems that you had a really tough but rewarding adventure….and as you said, it’s just the beginning.Thanks for sending Tigger here, he was a nice and welcome guest :-). I’ll read your post again to better understand everything and I’ll have a deep look at the pictures, but I really have to ask you who are the CRT volunteers or I won’t be able to sleep…. I wish You and Roy thousands of locks with Foxglove! Hi Davide, I wish I could say that CRT were the Clare, Roy & Tigger volunteers………..that would be funny, but in fact they were the Canal & River Trust, previously known as British Waterways.